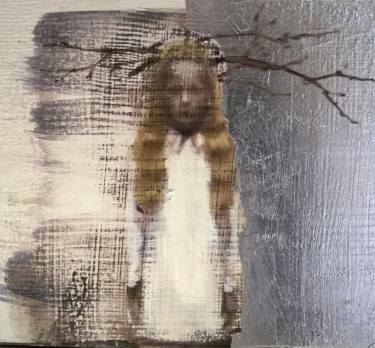 Viaton II (innocent) by Silja Selonen © 2015. Silja Selonen lives and works in Finland. She is interested in capturing the invisible world in the visible, representing time, matter, energy and gravity, through her painting. You can find out more about her here. Lily was unsure of her father’s idea to go all the way to the seaside by motorbike. She had never ridden with him without her mother also present. Back in Colombo she had felt secure on the bike, snug between them both, protected from the dangers that surrounded. But that was a long time ago; now she would be exposed. She could tell from her mother’s expression, as she waved goodbye, that she was worried too. It had been two months since Lily last saw her father. It had been an awkward visit to his London flat, just before Christmas. Her father’s friend Amanda had been there, and Lily had accidently dropped her baby, when she tripped on a rug. Though she felt a little shy at first, Lily held on to her father tightly, holding her breath as he weaved through traffic. She tried closing her eyes but found it made her feel nauseous, so instead she buried her head in his back, feeling his heat through the worn leather jacket. When they eventually arrived, her legs felt weak and were damp. It had drizzled throughout the journey and though her mother had made her wear an anorak on top of her coat, it had still not provided adequate protection. She was grateful to take her father’s warm hand as they trudged along the promenade. The rain got heavier as they walked, but Lily was grateful to no longer be on the bike. ‘Let’s get lunch. And how about some ice cream?’ Her father tried to sound eager. They found a deserted cafe along the seafront. The owner, grateful for their patronage, gave Lily an extra scoop of ice cream, which she passed to her father, having not fully got rid of the cold in her from the journey. Her father had asked her about school, and told her about Amanda’s baby, but now they were silent, staring out at the turbulent sea. ‘I’m sorry, Lily,’ her father said suddenly. Her father looked up at a couple who had appeared by their table. ‘If you’re finished, can you vacate these seats,’ the man said. Lily looked around the cafe and counted seven empty tables. ‘We’re not finished,’ her father said. The couple tutted and noisily sat down at the table next to them. ‘I hope they wash their cutlery and dishes thoroughly after that lot have used them,’ the man muttered to the woman. ‘It’s not right, is it?’ she responded tartly. The rain was torrential when they stepped outside, so they ran into a nearby games arcade. Lily did not understand what her father was saying, but was happy to be with him, in spite of the circumstances. ‘Daddy, please come back and stay with us,’ she said as he shook out her anorak. Lily spent the afternoon watching her father play the flashing machines, occasionally assisting him by feeding pennies into the slots and pressing the glowing buttons. She was soon bored as she didn’t understand the aim, but said nothing, wanting to delay the ride home for as long as possible. A couple of times a woman, in a short skirt that her mother wouldn’t have approved of, came to watch her father play. He didn’t speak to her, but Lily noticed him look at her when she walked away. As they started the journey home, Lily gazed at the scratches on the back of her father’s leather jacket, wondering how long it would be before she saw him again. She was grateful the rain had eased off, at least. An Rasiah lives in London. She writes short stories, attempts screenplays and has recently completed her first novel manuscript. You can follow her on Twitter.